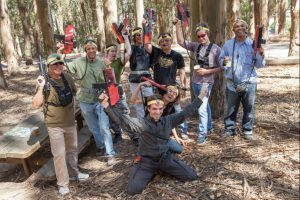 SFLasertag is an event producer and party organizer, hosting themed lasertag picnic parties in the San Francisco Bay Area. We specialize in corporate teambuilding picnic parties that help organizations become a more effective team. We play objective-based team games that require a coordinated strategy. 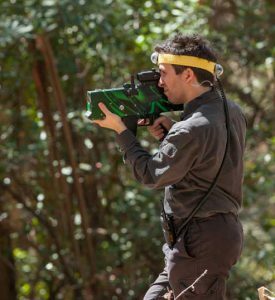 Our games utilize the latest high-end outdoor lasertag equipment, two-way radio headsets for every player, and a laptop controlled scoreboard. Our services include location scouting, permit acquisition, equipment rental, staffing, event scheduling, and arranging catering and transportation. We’ll organize all aspects of your next company picnic or large party. Our parties take place in area parks, open space preserves, open space wildernesses, and private properties throughout the San Francisco Bay Area. Our events last anywhere from a couple of hours to most of the day. We usually play games in a 3-10 acre unmodified natural wooded environment. Each game is around 12-20 minutes, with no more than 24 players playing at any given time. We usually have between 30-60 participants attending our events, and usually another dozen or so spectators. We can also setup a fun indoor arena for your company if it’s more convenient. For parks and conservation, SFLasertag events are totally passive recreation in that we never modify the natural surrounding. Our games generally have no more than 20 players in a 3-10 acre gaming area supervised by 4 referees. Our brighly colored lasertag gaming guns are very quiet and emit no projectile or real laser beam. Every player wears a radio headset so there is no shouting, whistling, or any obnoxious gaming noise coming from our events. Most of the time there are other park guests in our gaming area completely oblivious to the fact that we’re playing lasertag games. Our parks and preserves are our treasures, and we are determined to only play in areas where we can do so safely without impacting the park environment or diminishing the enjoyment of other park guests. We only produce these events with the approval of the park rangers, their respective park and recs department, and local law enforcement. Lasertag is an intense teambuilding activity, and we take many precautions to make sure that our events are both safe and sustainable. Half of the enjoyment of our events is enjoying the natural splendor and beauty that our parks and preserves provide. 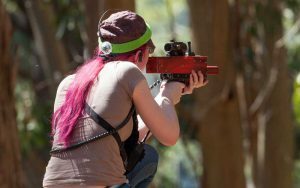 Most players at our events have little or no lasertag experience. Lasertag is a sport that’s easy to learn and fun to play for everyone. Our games are all about teamwork and strategy. We form teams of 5-10 players each and usually keep the same teams throughout the day. This helps build unity and teamwork among players. Our games are usually quite fun to watch as well as participate in. Between games, players can watch other teams play, listen to their radiocom traffic in the picnic area, and even watch the scores in real-time on our laptop scoreboard. If you want a recreational event that will seriously bring your team together, playing games that are all about accomplishing team objectives, all while having crazy amounts of fun, book your next event through SFLasertag.